Some folks have told me that my advocacy work doesn’t make a difference. That it either falls on deaf ears or only appeals to other people who have illnesses similar to my own. That raising awareness without raising money is a waste of time. And I think some of us start to believe that and it wears us down. It defeats us. It makes us alternately angry and sad. Why are we doing all of this, anyway? Are simply creating noise while silently losing friends? I have a story that suggests otherwise. My father (pictured with me above) is not a migraine sufferer. His brother and sister both have migraines, although not the kind of migraines that would prepare him for having a daughter like me. He has watched me thrash with pain, stagger with dizziness, wretch with nausea, cower with photophobia, and cry with despair. He has also watched me fight, advocate, educate, and succeed. For over a decade, my parents have both been enmeshed in every parent’s worst nightmare: watching their child spend their days in unimaginable pain and discomfort while being told by a variety of specialists that there was nothing else that could be done. As a patient, I know the kind of depression and helplessness that comes along with such a life but I cannot begin to fathom how it must be to watch your child suffer, day in and day out, with no cure in sight. That’s what makes this story all the more brilliant. My father is a professor at the local university, as well as a world-renowned scholar, prolific writer, and accomplished musician. When he asked me where his purple “Migraine Warrior” shirt was, I didn’t think much of it. 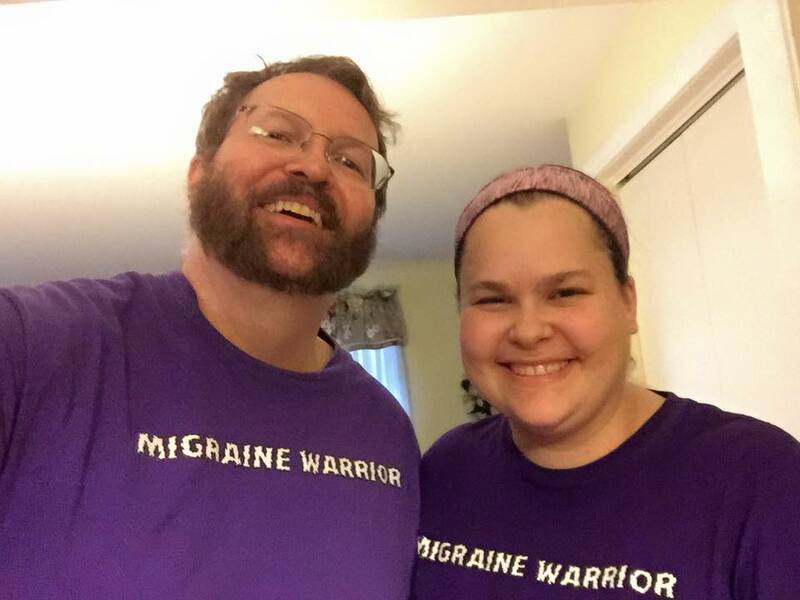 Because my Dad’s wardrobe consists almost exclusively of t-shirts and jeans, it wasn’t out of the ordinary for him to don that shirt, which he bought last summer as part of a migraine awareness fundraiser I had organized. It was only later that I learned that his choice to wear that particular shirt on that particular day was, in fact, quite pre-meditated. It was the first day of classes at the university and my Dad had taken to giving his typical introductory spiel. My Dad openly discusses his bipolar disorder and obsessive-compulsive disorder with his students on the first day of classes, opening up a dialogue where students can feel comfortable coming to him if they are dealing with something difficult. He makes mention of the university’s disability services and encourages students to make use of them and to not be embarrassed or ashamed to ask for or accept help. He tells my story of chronic migraines and my own foray into disability services. He makes sure that his students understand that he is an empathetic and compassionate person, one that will not discount them due to circumstances beyond their control. I think perhaps this partially comes as a response to the professor who suggested that I drop out of college because I’d never be able to hold down a job with my chronic migraines. I’m thankful that my parents, disability services, and another one of my professors made me understand that that professor was the one who was wrong. Because of our struggles and our willingness to be open about our journey, my father has been able to open the door of communication to countless college students who may be facing something similar. I hope that they hear his voice loud and clear rather than other people in their lives who may be telling them it’s time to give up. On a smaller (but no less important) scale, our advocacy work helps individuals. I’ve had chronic migraines ever since I began dating my boyfriend over 8 years ago. He’s been supportive and compassionate and empathetic beyond all of my wildest dreams and he came to me with a story the other day that made my heart swell. Apparently, he encountered a distraught young woman at work in the break room. When asked if she was okay, she replied “I’m having a migraine.” My boyfriend immediately crossed the room to turn off the television. On his way back, he shut off the lights. He asked “Do you want a Dr. Pepper or something? My girlfriend gets migraines and I know that caffeine helps her.” She smiled and thanked him, telling him she’d already drank a Coke with her migraine medication. I can only imagine how this young woman must have felt. So few people know what to do in a situation like this and even fewer have the courage to do it. In that moment, I can almost guarantee that he made her current situation much better with the simple elimination of light and sound, the offer to help if he could, and the acknowledgment that he saw her pain and understood that it was real because someone he loves suffers from that pain, too. The people around us listen. The people around us see. And some of those people take those words and images out into the world and make it a better place. As a result, there is more understanding and less stigma. Telling my story over and over and over again may not raise millions of dollars. But if we all tell our stories over and over and over again? We have the potential to change millions of lives. Thank you for telling your story repeatedly. We never know when it will produce awareness and compassion. Oh, Michelle! What a needed post! Thank you so much for sharing your journey and your thoughts. Your dad rocks, and so do you! Thanks for this post! I’ve shared on Facebook and Twitter! Thank you. I really appreciate your support. Feel free to share any of my posts that speak to you.